I’ve put off writing about Petit Oven for awhile now. Even last week when I attended their Pig Roast and Beer Toast, took plenty of pictures, specifically to write about them, I hesitated. Why? Because I’m selfish. Bay Ridge has been getting a lot of press lately. It’s a bit off the beaten path and isn’t the trendiest place in the world, but lately things are changing and I worry the hipsters might invade the neighborhood. We have a cute wine bar, Owl’s Head, a great California taco joint, Ho’brah, and my favorite, Petit Oven. Of course I want the world to know about my favorite restaurant, I just don’t know that I’m ready to share. The quaint French American bistro located just off 3rd Avenue in Bay Ridge seats about 30 guests. I like the fact that I can usually call the day before or even early evening and usually get squeezed in for a reservation for two. I’m not sure I can handle having to share with other guests and miss my Petit Oven fix. Owners Kat and Nicole really know how to make diners feel at home. With Kat back in the kitchen and Nicole running the front of the house, the restaurant runs like a well-oiled machine. It’s the type of place that if you stay away too long, you feel like you’re neglecting a good friend. Petit Oven’s $35 three course prix fixe meal is an absolute steal. You can get an idea of what their menu looks like on their website, but don’t set your heart on anything specific. The menu is seasonal and changes often, sometimes even day to day. Some of my favorite dishes I’ve had include sweet corn soup, homemade gnocchi, and honestly the best cassoulet I’ve had outside of France. There’s an à la carte menu too plus daily specials and a very affordable well-selected wine list. 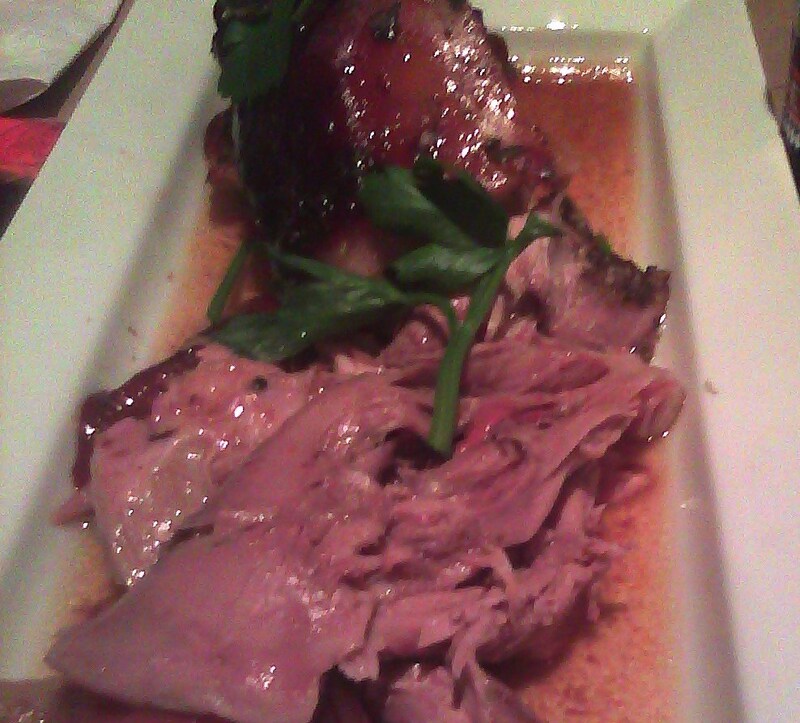 Now the reason I was at Petit Oven last week was for a Pig Roast and Beer Toast, paired with beers from Brooklyn Brewery. This was the first of many themed events to come promised Nicole and Kat. I hope so! The event was advertised mainly on Facebook and considering how small the place is, reservations for the single seating went FAST! Our entire meal was served family style, giving us time to meet some new friends. 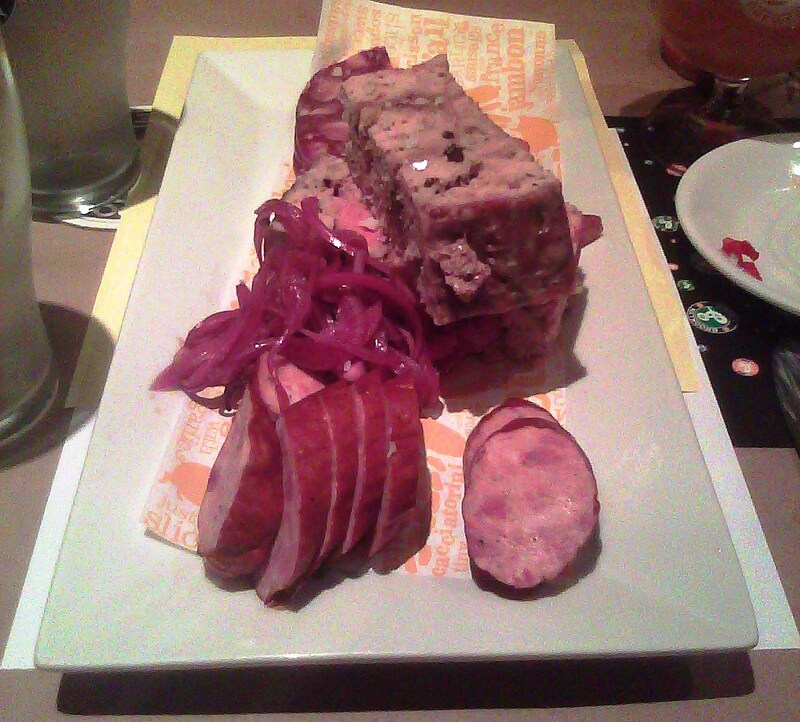 First off was an amazing spread of charcuterie, homemade pate, pickles, kielbasa and more. The plate was paired with Brooklyn Brewery’s Local 1 ale. DELICIOUS! I would have been set with just that, but I tried to pace myself knowing there was (much) more food to come. 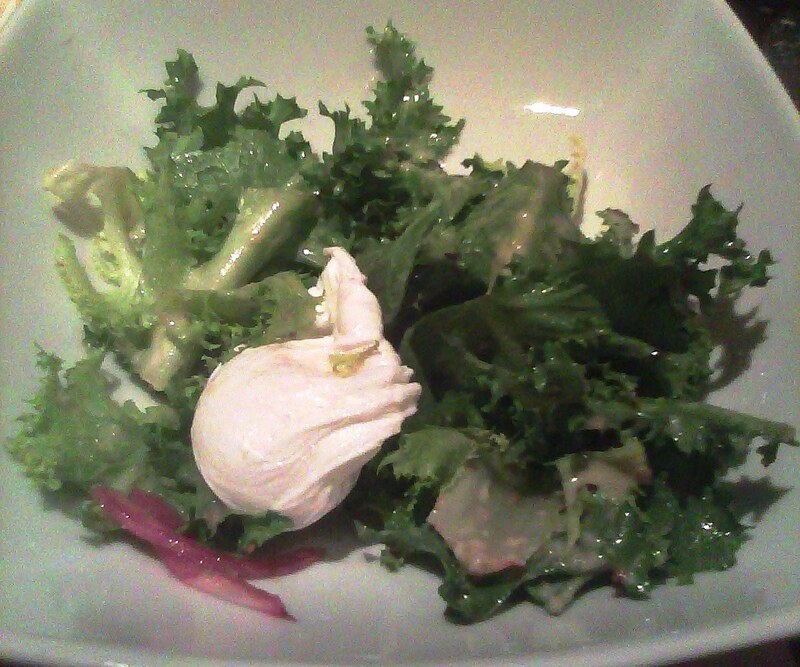 A light salad of local greens with pork belly and a poached egg helped us make room for the main course. Then the sides just kept coming! 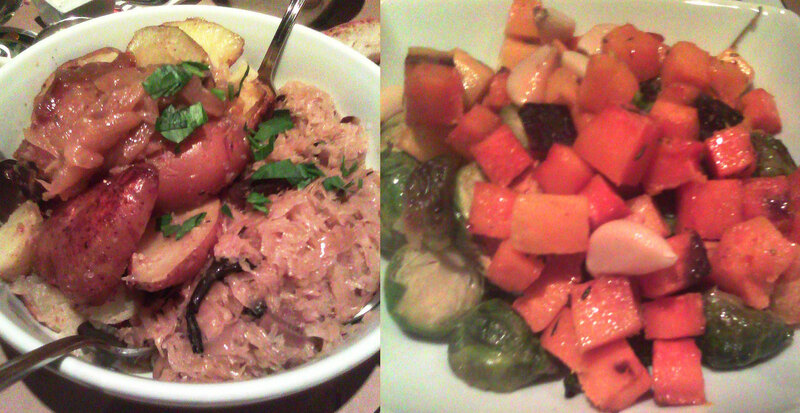 Herb roasted potatoes with sauerkraut, baked beans, roasted Brussels sprouts, local squash proceeded the main event. I have to admit, I was a little anxious to see the pig at first. I’m not a fan of meeting my food face to face so to speak. But once I tasted “Charlie”, there was no turning back. It was the most tender, juiciest pork I ever tasted. When I asked the secret, Kat said “low heat for a long time”. Somehow, I don’t think I could ever achieve the same thing. I swear she has some special magic hiding back there in the kitchen with her. The main course was paired with Brooklyn’s Oktoberfest, a nice light companion for the rich meal we had in front of us. Dessert? I was won over immediately when I found it was being paired with Brooklyn’s Chocolate Stout. My absolute favorite beer, as you probably already know. Both for drinking and baking. The stout went perfectly with the fresh cider doughnuts that seemed to keep coming. I can guarantee they were delicious. So delicious, I might have been so excited to eat them that I forgot to take pictures. Oops. Petit Oven is open daily for dinner from Wednesday to Sunday. 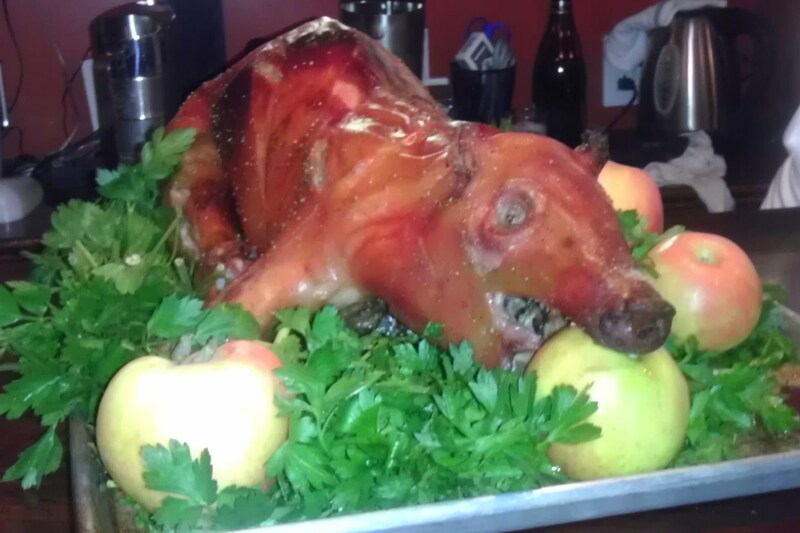 Facebook is the best way to learn about future events, like the Pig Roast, but I warn you, looking at their page will make you hungry. They fill my news feed with photos of delicious food. Nicole is a great marketer. Next postRemember Real Hot Chocolate? Hands down my favourite restaurant – was gutted not to be able to attend this because of a prior engagement! Love pork, and love Kat and Nicole. Our 3 year old loves it there too – she had her first mussels there, and she’s getting a real sense of culinary adventure thanks to Petit Oven! Hopefully us regulars can stay on some sort of VIP list once it a month wait reservation kind of place 🙂 I was actually surprised not to see you there. Even more surprised that we didn’t know anyone in the place besides Nicole and Kat!